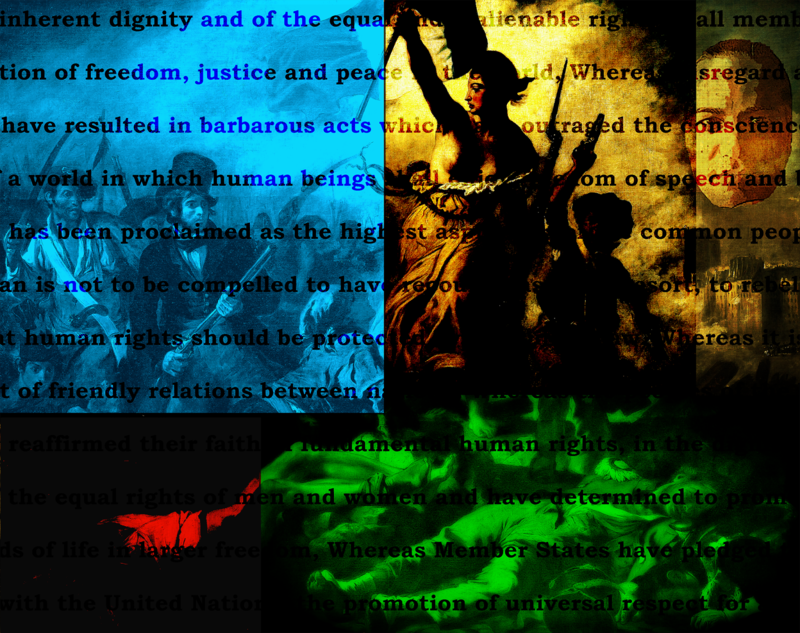 A series of digital deconstructions of Eugene Delacroix' "Liberty leading the people" inspired by the Syrian Revolution. The march towards liberty begins with ascension into Hell and culminates with acceptance of the mundane. For we are more defined by our mundane actions than our lofty ideals, or any search for glory no matter how it is conceived. To be free is to be reconciled to our limitedness even as we keep pushing our limits, and to savor our heavenly moments even as we burn in Hell. The Syria Conflict has by now produced what world leaders and UN officials are describing as the worst global humanitarian disaster in decades. In the face of this tragic development, words, my words in particular, have become increasingly hollow and quite deficient when it comes to helping me communicate what I think and, more importantly, how I feel about the unfolding tragedy. For this, it has become necessary for me to look elsewhere for additional means of communications, ones that can compensate both for the insufficiency of words as well as some my own shortcomings, such as the fact that I cannot draw or paint. 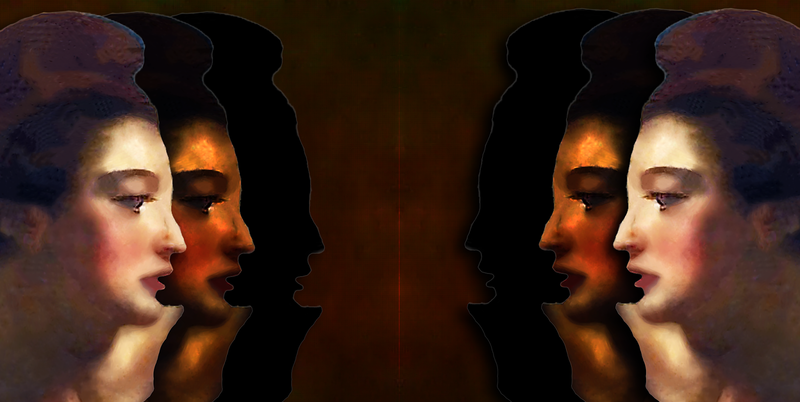 Enter Photoshop, and Eugène Delacroix. 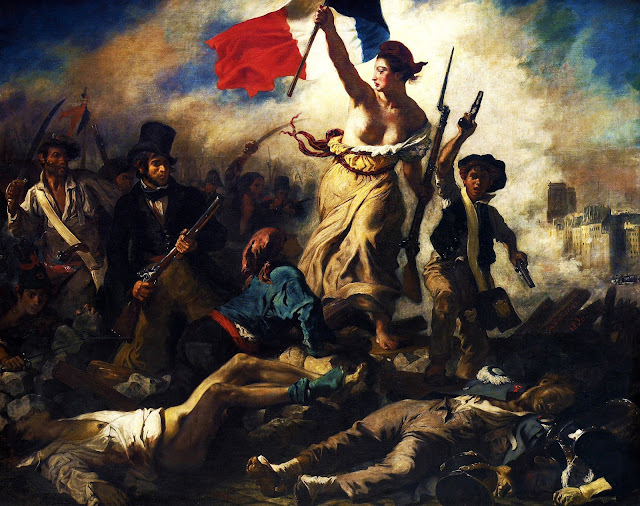 Like so many activists around the world, I have long found a source of inspiration in Delacroix’s famous oeuvre, “Liberty leading the people.” But, to me, it has also seemed too reverential and celebratory, considering the bloodshed and suffering involved in popular revolutions. It definitely could not have become a symbol for the nonviolent revolution I envisioned for Syria back in 2005, when I issued my first call for civil disobedience and published my first transitional plan. Indeed, the violent turn the Revolution was forced to take due to the violent crackdown unleashed by the ruling Assad regime, the apathy of the international community and unpreparedness of the opposition, was not at all surprising and represents the very thing I was hoping we could avoid. For the thing, that is, the violent implosion of my country of origin, did not seem inevitable to me, but was made inevitable through the failure of our efforts to resist it. These include my own efforts which, no matter how modest they happened to be, make me a culprit. While it’s almost impossible to reflect this culpability within the course of an intellectual analysis of the conflict in Syria, it’s almost impossible to hide it in a work of art. By providing a continuing series of digital deconstruction of Delacroix’s oeuvre, inspired as they are by the Syrian conflict, I find myself by necessity engaged in an ongoing archeological dig through my own mind and soul revealing the impact of the whole tragedy there. The idea of deconstructing Delacroix’ “Liberty” has been bustling in mind for years, but only in late 2013 did I finally muster enough energy and focus to pursue it. After three years and more than 7000 attempts, I finally began finding ones that seem to work for me both in terms of their overall composition and the technique used. So here I am, a person who cannot draw or paint, and who is far from being a Photoshop expert, making a claim, no matter how tentative, to being an artist. But then: why not? That’s how everything in my life began: with an uncertain tentative step, followed by a series of them. One has to be foolish enough to act on his presumptions sometimes, no matter presumptuous they might seem, to make any real difference. Understanding the works in this collection requires a certain familiarity with the original painting by Delacroix, especially what each portrayed character is meant to represent. Watching this video might help, so could this description on the Louvre Website.